The red carpet is rolled up and the films are back in their cans after 10 days of screenings and events at the 35th Montreal World Film Festival. But for one family who travelled to see their finished documentary for the first time, the festival was unusually special. Eve Leyerle and Hubert Lum took a special detour on their way home to Toronto after vacationing in Prince Edward Island. They travelled to the screening of the film about their family’s unique voyage to their adoptive daughter’s homeland. The film, “The Invisible Red Thread” premiered on August 26th at the Montreal World Film Festival. But curiosity about the film won out. “The Invisible Red Thread” documented Vivian’s return to her orphanage and the land of her birth, along with her poignant encounters with a locally adopted girl named Shumin Zhu. 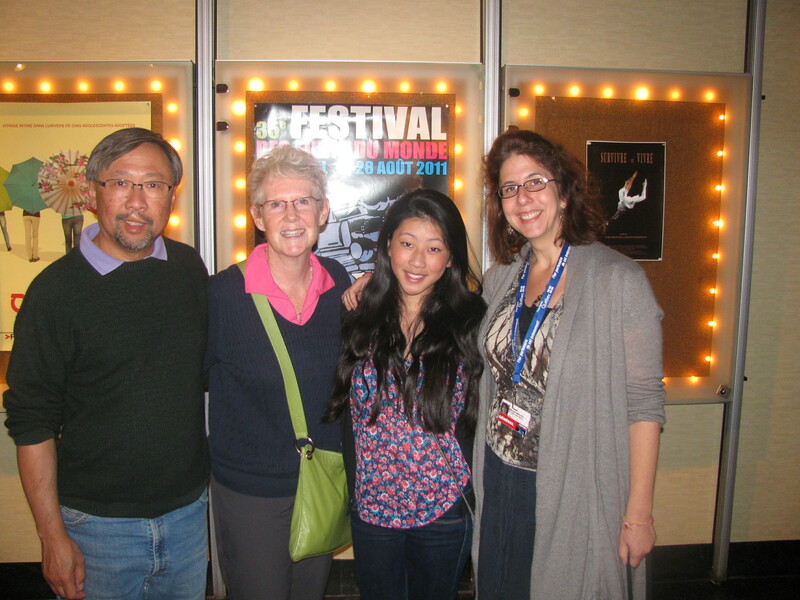 Vivian and her parents sat raptly throughout the film, then later were approached by members of the audience to discuss the story and their personal journey. “It was fascinating to experience it all over again”, said Hubert, who spent two weeks with Vivian in China. Eve also was moved by hearing from parents in China who had given away their daughters. Others wanting to view the film will have the chance later this fall and winter when it premieres on OMNI TV in Canada and is available for home and educational DVD sales. We’ll be posting more info on that as soon as we have it!